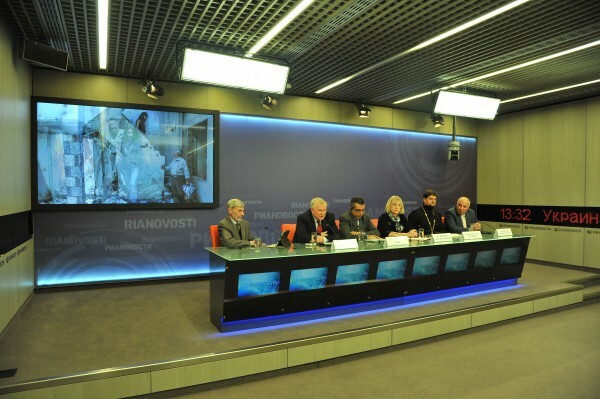 On 3 October 2014, a round table discussion was held at the International News Agency “Russia Today” press centre on the situation of Christians in the Middle East. Taking part in it were Ashur Gevargis, head of the Assyrian Patriotic Movement, Ms Yelena Agapova and Mr. Oleg Fomin of the Imperial Orthodox Palestine Society (IOPS), hieromonk Stefan (Igumnov), secretary for inter-Christian relations of the Moscow Patriarchate’s Department for External Church Relations, and David Khinyaev, head of the Assyrian community of Russia. Ms Agapova told the audience about the work done by the IOPS Public Centre for Protection of Christians in the Middle East and North Africa, while Mr. Gevargis spoke about the origin and activity of the Assyrian Patriotic Movement, and Mr. Fomin – about the IOPS efforts for protection of Christians in the Middle East. He also dwelt on the dire situation of the Assyrians. The same problem was touched upon by Mr. Khinyaev. Hieromonk Stefan noted in his address that the Russian Orthodox Church was deeply concerned with the distressful situation of Christians in the region and paid special attention to it.